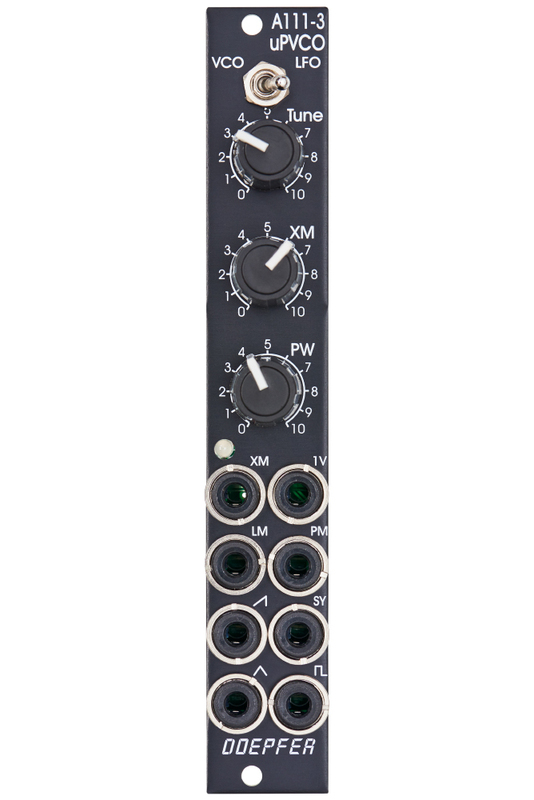 The Micro Precision VCO is a space-saving and utterly precise analog VCO/LFO with a extremely big frequency range, immaculate tracking over at least ten octaves and nearly perfect waveforms. Basically it is the same circuitry like the High-End VCO A-111-2 but with reduced functions and controls.Yet it is super suitable as a modulator for exact linear FM and much more. The XM potentiometer can be used as a fine tune control as long as nothing is patched to the XM socket. 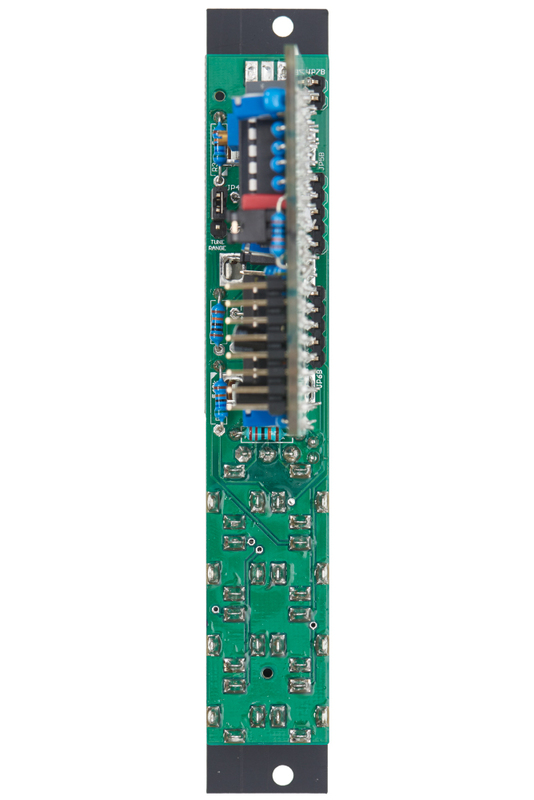 The oscillator has a frequency range of at least fifteen osctaves (0.0001 - 40Hz in LFO mode; 0.5Hz to 20kHz in VCO mode) and offers perfect 1V/octave tracking over ten octaves minimum, typically in the range of 20Hz to 20 kHz. Frequencias below 25Hz are visualized with a two-color LED. 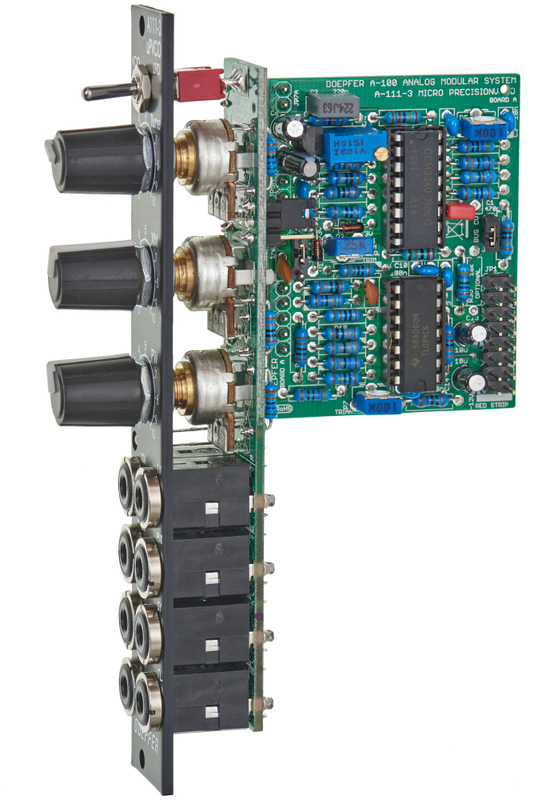 The 1V/octave input is accompanied by two FM inputs, one for linear and one for exponential frequency modulation. A jumper determines whether the module obtains pitch CV via the internal bus. The VCO has a triangle core from which sawtooth, pulse and sine are derived. The wave forms are almost perfect and sans glitches. The pulse width can be set with a control from 0 to 100% and of couse it can be modulated. There is one input for oscillator synchronisation and its type, either hard or soft sync, is jumper-selected. Both types differ in sound with the hard sync being more aggressive and richer in harmonics.